Rick Prelinger is an archivist, writer and filmmaker. His collection of 60,000 ephemeral films was acquired by Library of Congress in 2002. Beginning in 2000, he partnered with Internet Archive to make a subset of the Prelinger Collection (currently 6,900 films) available online for free viewing, downloading and reuse. Prelinger Archives currently holds some 15,000 home movies and actively promotes collecting, research and access in this emergent area. His films include the archival feature Panorama Ephemera (2004), which played in venues around the world, and No More Road Trips?, which received a Creative Capital grant in 2012. His Lost Landscapes participatory urban history projects have played to many thousands of viewers in San Francisco, Detroit, Oakland, Los Angeles and elsewhere. He is a board member of Internet Archive and frequently writes and speaks on the future of archives and issues relating to archival access and regeneration. With Megan Prelinger, he cofounded an experimental research library located in downtown San Francisco. He is currently Associate Professor of Film & Digital Media at University of California, Santa Cruz. Essay Review: What, in your mind, is Lost Landscapes? And how did it begin? Rick Prelinger: Second question first: Lost Landscapes began in 2006 when Chris Carlsson, cofounder of an organization foregrounding local histories not part of the triumphalist canon, asked me to put together a program of archival material. But it also began in 1991 in Britton, South Dakota, when I found three hours of home movies shot in 1938-39 by Ivan Besse, manager of the Strand Theater, and took them back to Britton for a screening. As the audience sat in the Strand watching Ivan narrate fifty-three-year-old scenes of themselves and their kin, the room stirred with excitement and conversation, and I realized that moviegoing and silence weren’t necessarily intertwined. The first Lost Landscapes of San Francisco show was equally exciting. Some 120 people squeezed into a 70-seat dance theater and filled the room with comments, glossed by a chorus of experienced local historians seated in the first row. I returned to the same venue with a new program in 2007, but this time we had to turn people away. A friend from Long Now Foundation (designers of the 10,000 Year Clock) attended, and suggested I consider putting on the next iteration as one of their “Seminars on Long-Term Thinking.” So the following year we moved to Cowell Theater, on a pier jutting off from Fort Mason. I’ll never know exactly what happened, but some 400 filled the auditorium while many more waited outside. Long Now hastily rigged up a video monitor in the lobby for another several hundred, but I am told that many more never even got that far. I am not an advocate of scarcity, so was happy to move to Herbst Theater, a beautiful old room in the War Memorial that seated over 900. There we stayed for three years, until moving to the [famous] Castro Theatre in 2012, where we have now been for five years. The most recent show (December 2016) played to 2,600 people on two nights. I have also done repeat shows at Internet Archive and elsewhere since 2012, and in 2013 made a more ambitious four-screen installation blending public and private histories at the Oakland Museum of California, which was seen by many people over half a year’s time. The Detroit series (five iterations so far, 2010-12 and 2014-15) began opportunistically. I’ve had a great interest in Detroit’s contested history (especially its history of race relations and labor) for many years, and, starting in the early 1980s, visited the city many times to collect industrial films. As one of the major centers of American industry, Detroit was also a locus of media production, and specialized studios (including the famous Jam Handy Organization) produced tens of thousands of industrial films from the 1910s through the 1980s. After I began to get serious about collecting home movies in the 2000s, I sought out films shot by Detroit families. And when offered a screening gig at Columbus’s Wexner Center for the Arts in 2010, I asked friends in Detroit whether they could connect me with venues to do a Detroit screening. They introduced me to people at MOCAD (Museum of Contemporary Art Detroit), who didn’t know me and I didn’t know them, but said yes. What transpired was a familiar story: we put out 150 chairs in MOCAD’s cavernous space (once an auto parts factory) and some 400 people showed up, representing most of Detroit’s distinct communities. Since then I have made four more Detroit films, presenting them at MOCAD, Salt & Cedar Workshop, at Detroit Free Press’s Freep Film Festival at the Detroit Institute of Arts, at Traverse City Film Festival and many venues outside Detroit. Yesterday and Tomorrow in Detroit (2015) from Rick Prelinger on Vimeo. After making a number of city-specific film events, I was interested in making one with broader (read: more national) significance, and made No More Road Trips? in 2012-13. This was the first film for which I received funding, and the generosity of the Creative Capital Foundation made it possible for me to do very deep research, buy many thousands of dollars of hard drives, and scan film in a profligate manner. Made completely from home movies, the film traced a dream automobile journey from the Atlantic to Pacific using footage from about 80 families shot between 1924 and the late 1970s. Originally intended to provoke discussion about the changing nature of mobility in North America and the potential oncoming obsolescence of auto travel (“peak travel”), the film may perhaps have been more successful as a realization of geographer John Brinckerhoff Jackson’s formulation that “Landscape is history made visible.” Like the Lost Landscapes events, Road Trips? 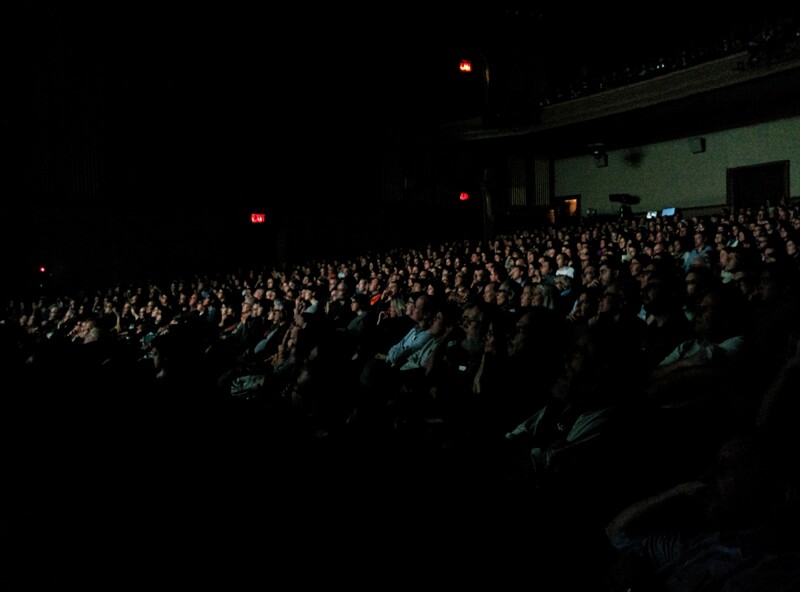 was designed to be seen by vocal audiences, and while it’s in some ways a contemplative film, it generally causes audiences to speak freely and loudly. It has been widely screened at festivals, universities, and community events in North America, Europe and Australia. No More Road Trips? A dream ride through 20th-century America made from home movies from Rick Prelinger on Vimeo. I’ve also made an Oakland Lost Landscapes, which starting in 2014 played many venues in and around Oakland and Berkeley, including the Oakland City Council chambers. But since I live in San Francisco, I felt the Oakland event should become a community project maintained by Oaklanders. So I “repatriated” it to an Oakland writer, artist and activist Alex Cruse, giving her the film and the raw footage, and I plan to update the gift with new material as it emerges from time to time. In 2015 I began work on a Los Angeles film, which first screened as a work-in-progress at REDCAT Theater in downtown LA late that year. I completed it at the very end of 2016 and premiered it as a completed film in Rotterdam and at two screenings in LA in late January. This film turned out quite differently than the others. While it is rich in detail, it isn’t about regional minutiae. I consider it part mythic as well as topographic, except that unlike most evocations of LA that draw heavily on its show-business history, the mythic aspect is derived from topography and amateur cinema rather than from popular culture. I speak during all the LL events — identifying places, contextualizing footage, triggering the audiences to speak as freely as I can urge them to — but the LA film could easily be shown without me, and even without audience participation. As I edited it, I realized I was making something that verged on being a film-film, rather than a film-event like the other Lost Landscapes. It’s basically a contemplative film that works with or without audience participation, though I’ve noticed audiences tend to rely on an MC to rise to the occasion and open their mouths. And it even has explanatory titles providing dates, places and identifications. I’ll be fascinated to see how audiences respond to it as it shows around. And so, what is Lost Landscapes? It’s about much more than attendance numbers. What’s most striking is the intense level of interest these events have awakened, and the nature of the interactions that occur during the shows. On the surface the films are simple, lightly produced compilations of archival footage relating to a city or an area, and for some viewers the screenings are exercises in collective nostalgia. That’s not the way I present them, however: I emphasize the events are not simply revisitations of the past, but undertaken to encourage and sustain discussion about possible urban futures. Eschewing narrative and character-driven structures associated with contemporary mainstream documentary, they are lightly-edited but intricate, foregrounding archival film segments as evidence. I would call them popular documentaries with physical presence and participation at their core. Lost Landscapes of Los Angeles (2017) (excerpt, Japanese American Citizens League conference, 1938, shot by Carl T. Hirota DDS) from Rick Prelinger on Vimeo. Essay Review: What goes into creating a new addition to Lost Landscapes? Where do you find your footage? Rick Prelinger: Making the San Francisco event has become an annual ritual for me. Research takes far more time than production. I continually look for relevant material within our own archives, which are quite deep and expansive; I estimate we hold some 15,000 home movies, of which we’ve only seen about a third. San Francisco and other urban history material show up everywhere in the collection, and surprises emerge almost every week. We regularly scan film at Internet Archive (averaging 150 reels per month), whose film scanner works really well with 8mm and Super 8, allowing the often indistinct images on small-gauge film to be much more legible. While 16mm home movies are much higher resolution, all gauges of home movies contain a tremendous density of visual information. It’s amazing how many details emerge when home movies are blown up to big-screen proportions. In addition to our own collection, people who know of the screenings offer me material from their family collections; archivists come forward to offer the use of films in their archives; and I hear about material that local history organizations have collected from their constituencies. People also scout films for me in their communities; the Detroit films would be much less interesting had I not experienced the kindnesses of Tim Caldwell, Nancy and Keith Hay and Dave Toorongian, four Michiganders who constantly offer me material they find and consider relevant to future Lost Landscapes. Thanks to them, I’ve got a huge backlog of Detroit film still to be viewed. And though it’s less and less affordable, and though sellers usually break up collections and destroy their integrity and hide their provenance, I still sometimes buy films on eBay. eBay has surfaced many important historical materials but broken up many collections — one way of thinking about what it does would be to imagine taking apart the pieces of a unique puzzle and hiding them all over the world. I recall one seller who took a 400-foot reel of home movies containing footage of Dr. Martin Luther King, Jr. and broke it up into four 100-foot reels so that he could make four sales. The four parts all went in different directions to purchasers whose anonymity was protected by eBay. I used to think that new film would stop surfacing, but quite the opposite: the pace of discovery has actually accelerated these past few years. There is still much to be discovered, and I hope the existence of so much film unseen in public will encourage people to start projects like this in other cities. Recently, we’ve seen Siobhan Hagan, an archivist in Baltimore, put together a great event focused on her city. Essay Review: What kind of footage do you deem important to include? What are you less interested in including, and why? Rick Prelinger: At its start, Lost Landscapes included footage from newsreels; industrial, sponsored and government films; home movies; advertisements and commercials; and even a feature film trailer in one case. But even though San Francisco constantly appears in old movies and TV shows, I avoided using this material, as I didn’t want popular culture memes to play a role in my films. Just as there’s far too much entertainment about the entertainment business, there’s far too many treatments of “San Francisco in the Movies.” I leave that for other scouts. In my recent iterations (and in the Los Angeles film) the mixture has reduced down to fewer kinds of elements. The recent films are made primarily of home movies, with occasional process plates (see below) and outtakes thrown in. I could write at length about the importance of home movies to this project, but I’ll restrict myself to a few remarks. “Cinema” means different things to different people; to me, it has come to mean home movies. But at the same time I’m not completely convinced that home movies are cinema. They might perhaps be something closer to diaries, scrapbooks, messages exchanged between family members or other close groups. While they exist in reciprocation with dramatic films (home movie subjects often “act” as they’ve seen in the movies; movies often simulate a “home movie” look) they have little to do with other kinds of work captured on film, video or digital platforms. They’re effectively infinite, and the pace of home movie discoveries never slackens. And though they’re heavily normalized and codified, they are full of deviations from the norm, and their charm lies both in familiar tropes (two hundred birthday parties) as in small variations. In both their unpredictability and predictability, they are charming to watch. They are packed full of detail, so much so that the detail often upstages the foreground action. Similarly, their periphery may be more interesting than their center; behind tricycling kids in the foreground, for instance, we can see Detroit houses, streets and sidewalks in every era. They are easy to describe in cursory fashion and impossible to describe completely. They pose a huge challenge to traditional film archives that are accustomed to collecting and preserving completed films or TV programs, because they violate so many rules of neatness and predictability. The number of extant home movies feels infinite; they are difficult to describe in all but the most general ways; there are all sorts of issues around copyright, privacy and respect for subjects; they pose massive storage and preservation problems. One might even argue that even though they share the same physical carrier as other kinds of films, that home movies are sufficiently unlike movies that they shouldn’t necessarily be kept in film archives. Perhaps a community archives model is more appropriate, where resources are described, maintained and shown within the community where they were created. One distinctive virtue of home movies is that they help to solve the problem of overnarrativization that is the curse of contemporary documentary, whose gatekeepers require narrative arcs and compelling characters. Every home movie is de minimis a capsule narrative, if nothing more than the articulation of a relationship between the shooter and who or what is being shot, and many home movies are complex narratives at that. Home movies level caste distinctions between animals and humans, between places and their inhabitants, but at the same time they trick us into thinking we understand the relationships they portray when really we may not. All of these elements, and more, fit into the often-chaotic home movie frame. They are also a kind of universal documentation — everything you could ever imagine was shot by someone, somewhere, sometime, and if you think you can propose something that no one shot, I bet I can find you an example. Home movies are redolent with historical significance that is easily interpreted by any viewer if you create the context for doing so. Finally, they’re replete with evidentiary value. In the beginning I mostly used film that showed places and landscapes no longer in existence, and it took a long time for Lost Landscapes of SF to shift towards majority-home movie mode. But after about 2010 I realized that footage of streets, buildings and neighborhoods wasn’t enough — I’d concentrated on the ground rather than the figure. I came to understand that footage of people doing what people do coalesced to constitute a human landscape, and that landscape wasn’t just seen in long shot; landscape was the stage on which people performed social relations with one another. Landscape, in fact, is a product of human life, labor and leisure, as home movies eloquently show. So now most of the films’ running time is built from home movies. I should also state that home movies also tempt audiences toward immediate identification with their subjects, and their intimacy and the historical material counterweight one another. I’m often asked whether using home movies skews the shows toward depicting wealthier families. I have to answer, mostly not. While it’s true that the first ten years of home movies (1923-33) mostly emanate from families of means because of the high expense of film stock and processing (about $1400/hour, in today’s dollars), the introduction of cheaper 8mm movie film in 1933 enabled a much more diverse group to shoot home movies. There’s a flowering of home movie expression in the Thirties — working families, families of color, rural families, youth all shot home movies, and the breadth of documentation is extraordinary. We’ve even found important collections of 16mm shot by working-class families. So the universe of available images is more inclusive than most people imagine. Personal expression, not corporate expression. Small-gauge cameras were almost everywhere and witnessed almost everything. Cameras, extensions of hands and eyes, made fluid and often intimate records of daily life. They often provide surprising and hitherto-unseen records of historically significant events. They are records of quotidian events that often escaped recording otherwise. They document everyday rituals, ceremonies, and behavior; commonalities, but even more important, divergences. Their ubiquity and sheer number (many millions) render them indistinguishable from the world they record. No conventional film can ever be as unpredictable or violate received logic as much as a home movie. They present stories without the excessive narrativization plaguing feature films and current documentaries. You think you’ve seen them before you start the projector, and afterwards you realize you really haven’t. I can think of no other type of record I’d like to preserve en masse in a very cold and dry Moon-based vault. Body language, lost landscapes, love & work, nature/culture, human/animal; all central themes are present. Gestures at once banal and eloquent, puzzles of the obvious. Movement and unpredictability plus Kodachrome are dinner, drink, and dessert all at once. Easy to riff and describe, but enigmatic beyond description. Archival films that leap over the class barriers that often limit the propagation of history. They so eloquently show us what to celebrate and what we must put behind us, which are often the same. They engender empathy for actual people rather than invented characters. The introduction of cheaper 8mm film in 1933 enabled many working-class families to record their lives. Showing and reusing them today invests audiences with the feeling that their lives are also worth recording. Unwitting tools capable of linking past and future. The San Francisco and Los Angeles events have also been deeply enriched through the use of background process plates, a category of footage high in evidentiary value that most people have seen but few would recognize. If you’ve seen any film from Hollywood’s heyday showing people driving a car, riding in a cab or a train, or even atop horses, you’ve seen process plates — moving backgrounds shot for rear projection, sometimes seen through windows. In the movies, these appear out-of-focus and jumpy. But the original process plate is rock-steady, sharply focused and quite often a dense record of the look of a street, a road or the countryside. Notoriously frugal studios shot many variations of the same process plate to give editors multiple angles to cut with, and saved everything. And while process plates are rarely seen outside studio libraries, they can be amazing records of cityscapes, especially when shot with a moving camera whose point of view may stretch for miles. In a funny way process plates transform motion in space into motion through time. Lost Landscapes of San Francisco 10 (2015) from Rick Prelinger on Vimeo. Essay Review: What goes into the ordering and organization of footage? Do you start with a structure in mind? Different structures emerge in different years. In some years I’ve followed historical trajectories; in others, topographic. In San Francisco the films generally begin with an entrance to the city, but not via freeway as we usually enter today. Sometimes they enter the city by water, other times by landing at the airport, but not our current airport — perhaps the little airport as it existed in the 1930s. They continue through the city’s neighborhoods, often spiraling outward from downtown. And they often end at the water — at the Pacific Ocean, or at the long-gone saltwater Sutro Baths, or even at the Farallones, a chain of rocky islands 30 miles west of the city, but technically located in San Francisco County Supervisorial District No. 1. Over time the events have become much more intricate, and while I still firmly believe in what I call “underproduction” — that is, avoiding distracting embellishments like voiceover, music, visual effects and complex audio editing — I spend a great deal of time on individual edits and overall sequencing. But at the same time I try not to overedit within sequences. By now my audiences, at least in San Francisco, are attuned to the roughhewn qualities of home movies and know how to look at outtakes and other material that might not find its way into other kinds of films. I have no problem showing glitches, flash frames, dirt and fuzz, and even reproducing repetition, as that makes it clearer that I’m privileging my role as anthologist over auteur. But since 2012 I’ve also made everything in HD, tried to make or buy high-quality film scans, and often ruled out using poor-quality material. Every so often someone sends me a link to some YouTube video that’s briefly going viral, usually a family home movie of a tourist trip to San Francisco. Most of these films are unremarkable, but the comments reveal the fascination and wonder with which even garden-variety home movies are regarded by non-jaded viewers. I think I’ve spoiled Lost Landscapes audiences, who often don’t realize that I use perhaps 2% of what I collect. That said, careful repetition is important to repeat audiences (there are more than a handful of people who have attended all 11 San Francisco programs). While I repeat favorite sequences from year to year (the BART “Along the Way” song; the chase up the unfinished Embarcadero Freeway) I strive to make each year’s program mostly new. Recent programs have ranged from 75 to 90% all-new material. Essay Review: You’ve called your Lost Landscapes programs “essayistic interventions.” Can you talk a little bit about both parts of that formulation: “essayistic” and “intervention”? Rick Prelinger: Essays take different forms: exposition, meditation and argument, among others. And so do interventions, which might come as a surprise in the middle of a process that seems to be about something else, or as defamiliarization or reformulation of a relation that suddenly no longer seems predictable. As essays, the Lost Landscapes films can take all three forms. They are easily apprehended as exposition; structured as meditative experiences (though this is sabotaged by my concurrent invitation to viewers to raise their voices) and argue for taking a critical historical (and futurist anterior) approach to the city. And they embody a strategy I call “historical intervention,” which in simplest terms is reinjecting the record of the past in the present so as to affect the future. I hope to enable a jump from images to ideas. If presenting vivid historical images of familiar scenes and places triggers viewers to contemplate visible and invisible differences between past and present, I’d like to cause an analogous jump from present into future. Since this may seem obscure, perhaps it might help to differentiate Lost Landscapes from what it is not. As makers and audiences, we have collaborated to make cinema into one of the most anti-intellectual media forms of our time. We have elevated what we call “storytelling” — a reductive amalgam of “narrative arc,” “compelling characters” and “bankable stories” — into the normative form of cinema, and anything that falls outside the harmonious intersection of these elements must fight its way to the screen. To enable films, makers have, over time, constructed a collection of tricks (or, if you prefer, representational tools) to tell stories in relatively predictable ways, albeit wrapped in constantly evolving skins. After squeezing ideas through narrative cheesecloth, they make films loaded with emotionally overwhelming music, highly dramatic sound design and intricate visual effects. Much mainstream cinema builds on familiar, time-tested tropes in stylistically dynamic wrappers. None of these attributes are in themselves evil, but their combination doesn’t generally function to help us articulate ideas or think through complexities, with the exception, of course, of enigmatic films that leave loose ends to be resolved in future sequels. And most filmmakers are content simply to broach questions or testify to the existence of ideas without really delving into them. Few construct subtle arguments. And fewer show images without detailed explanations to skew audience understanding toward a desired trajectory. By contrast Lost Landscapes tries, perhaps quixotically, to encourage audiences to look squarely at images without expecting explanations other than those that come from their peers in the room, to value this relatively unmediated evidence as highly as they might value drama or documentary, and to think about what this evidence might mean. And yet these films are not the tightly-crafted essays my high-school English teachers tried to wring from me. Each is a snapshot of what I want to make with the footage I possess at editing time, and I make each one in full realization that others will follow. They embody what filmmaker and cultural theorist Craig Baldwin calls “availableism” and what architect/designer Sara Dean calls “considered non-completion” (speaking of Lost Landscapes of Detroit). And just as each film is really all of the films in serial, the audience comprises many regulars, who react to each event as a moment in a serial practice. But the number of regulars is not static; it increases each year. Essay Review: Something you said over an earlier email conversation really interested me: that “the filter of local history” tends to throw up highly granular detail as a defense against “tough or irreconcilable questions.” What kinds of “tough or irreconcilable questions” about our cities and physical spaces are you trying to provoke? How do you balance the “essayistic intervention” and the fixation on local history/landmarks that many viewers are going to bring to a screening of a Lost Landscapes film? How is it possible — if it is at all — to provoke these tough questions within your format? Rick Prelinger: This is a hard question, because it points to a point of divergence between the audience and me. I don’t say this from the stage, but I am much less interested in the minutiae of local history than I am in the process of daylighting it, in the relationship of history and contemporary life. I thrill at surprising audiences with newly found images, but I don’t think I need to feed my mental map with detail in quite the same way many others do, though I am deeply focused on the slippage between place as I experience it in the present and my image of how it may once have been. But many in my audience are fascinated with historical detail. I love that this is true, and I am in awe of the complex time and space mapping that lives in the heads of many in our local history community. I am often accosted by older members of the audience who ask me incredibly granular questions about neighborhoods or about scenes on location in movies and TV programs. But I tend to think more about the conditions prevailing in the past than I do about the specifics of what was where when. I see San Francisco, Detroit, Oakland and Los Angeles as cities of extreme contestation, cities in which battles were fought to maintain racialized power and control, cities filled with zones where bodily safety was contingent on race, class, gender and age. Not everyone wants to recall how African Americans have been priced out and “redeveloped” out of San Francisco, especially since World War II, or how Chinese families were prohibited from living on the west side of the city for many years. And these are the tough (and hopefully one day reconcilable) questions that many would prefer to avoid talking about. I hypothesize that focusing on the web of granular historical detail may screen out uncomfortable issues. Or perhaps people have become too worried about the possibility of evoking anger or triggering conflict. But to me acknowledging every element in a city as the product of some sort of conflict, as the embodiment of power relations, is unavoidable, and this becomes part of my live commentary as the films roll by. And today, every city is under pressure. It’s impossible to recall urban histories without considering the urban present. Detroit is in the midst of a narrow renaissance based in a few areas that are once again attracting capital and philanthropic funding. But most of its neighborhoods still hurt with little relief in sight. San Francisco and Oakland are stressed by rapid population growth, wildly uneven distribution of wealth, massive displacement, and overbuilding without sufficient new infrastructure. I would be the last person to deny the fascination of the past, but the potential of the future interests me much more. But when I introduce each screening by saying that it’s about the future as much as about the past, I’m not sure how many people hear me. My positionality is also a very real issue. Who am I to speak about these cities? Making events that incorporate and implicate the lives and histories of others might be less presumptuous than making documentary films, but to interpolate oneself as an teller or reteller of histories is to construct one’s own pedestal. I’ve constantly got to ask myself whether these are my stories to tell. And usually they are not. Do the people who inhabit the place shown in a film want to recall the events, trends and relationships the film shows? That is not something I can decide. In San Francisco (where I live), this seems like less of a problem. But I’ve had to have many conversations and think hard about the implications of my showing films about Detroit that were mostly made by Detroiters. In general I think of these events as inputs to a process that I only assist — that I’m only involved in as a scout and presenter, but not necessarily as an interpreter or authority. I tell Detroiters that the future of their city is theirs to decide and theirs to struggle for, that the images I’m showing are a contribution to their discussions and that I’m not trying to express an opinion about what they ought to do. At the same time I make the programs available online so that community members can show them as and where they please, and remix the footage to make their own historical videos. (For the first program, I produced DVDs and gave them out at the screening.) After the first three programs in Detroit, I also realized I didn’t want to use the Lost Landscapes title any more, and changed the title to the rather prosaic Yesterday and Tomorrow in Detroit. It seemed to me that it was up to Detroiters how much they wanted to engage with a discourse of loss. The question of who is shown and who is absent in the footage can raise questions of inclusion and erasure. Though the surviving corpus of home movies depicts a more diverse group than most people imagine, it is far easier to find material that correlates with whiteness and wealth, and it can take very hard work to represent the ethnic mix of most places. Audiences who don’t know that film stock and processing for home movies between 1923 and the mid-1930s cost $1400 per hour in today’s dollars will ask why there are few people of color in older footage. Over time I have found significant holdings of Bay Area material representing many communities. But workers at the event where I first presented the completed Lost Landscapes of Los Angeles in early 2017 asked why there were so many more minutes (about 40) showing white people than minorities (about 8), and why I used so many landscape shots that were relatively empty of people. They suggested using news and documentary footage so as to more fully represent the life and labor of Black, Asian and Latinx Angelenos. While that isn’t really the kind of work I’m doing, I accepted their critique. But it will take serious work to address that disproportion. By contrast, I have worked hard to represent both Black and white Detroit. This is perhaps one reason why Detroit’s communities have been so kind in furnishing footage to use. But I must say that there have been screenings in mostly-white parts of Michigan during which I can hear intakes of breath when images of Black Detroit come on screen. The emotions surrounding the white diaspora from Detroit are often still raw, and many white Detroiters express discomfort with images showing Black emergence in the city. Despite these considerations, doing nothing is not an option. And neither is archival enclosure. Those of us who control or are custodians of historical imagery cannot hold it back from exposure or wait for the “right people” to come around and make use of it. Not every use instance can be perfectly motivated and flawlessly executed; we need to take risks and engage with communities to daylight material that every generation needs to see and reinterpret through their own lenses. But ultimately communities have the strongest claim to their own history, and I take it on faith that this is where history is most effectively presented. This leads us back to intervention in another realm. I’ve come to feel that these shouldn’t only be staged as big-room screenings of a film made by one person with considerable archival privilege. What if Lost Landscapes evolved into a community project whose work happened mostly at the neighborhood level? What if younger makers, for instance, connected with elders to find images, explicate them and identify people pictured, and edit shows that would first happen locally? Later, neighborhood segments might coalesce into a longer-form film that could be shown to the entire city. But to shift the emphasis from putting on an event to enabling a process of local connection and discovery would relocate historical agency from one filmmaker to many others, and perhaps be a stimulus for media training as well. All it takes is somebody to run it! This is why I repatriated Oakland to an Oaklander, and why I’m looking for a Detroiter or group of Detroiters to take their film and turn it into a community project. Essay Review: I imagine that this kind of participatory work — if you can bear the analogy, sewing together quilt-cities from scraps many audience members might feel personally attached to — provokes the occasional strong and emotional reaction. What kinds of comments do you get about Lost Landscapes? How can people react, and have any reactions particularly surprised you? Rick Prelinger: I have already mentioned negative reactions, but in fact the positive ones are harder to address. The enthusiasm around the events is sometimes difficult to deal with. In San Francisco, shows sell out very quickly. Often people are turned away, or lose hope and don’t even try to get tickets. Lines are long, and when they begin to move, people run into the theater to grab their favorite seats. Regulars sit in the same place from year to year. There is an entire “balcony culture” whose activities I’ve never seen. But I wish there was more serious critique of the event itself, and that more people responded to the event in terms that went beyond direct responses to the historical images. There’s too much distance between how people respond to these events and why I do them. More positively, I’ve discovered that home movies become something else when blown up to theater-screen size. The change of scale provokes a role change in the audience, who without necessarily expecting it become more than simple commentators. They turn into ethnographers, noticing and often remarking on every visible detail of kinship, word and gesture and every interpersonal exchange. They also respond as cultural geographers, calling out streets and neighborhoods and buildings, reading signs aloud, repeating tradenames and brands and marking extinct details in the cityscape. If I could capture them (and I generally cannot, because it is hard to intelligibly record the voices of hundreds of people in one room), it would play back like an urban research project distributed through a crowd of investigators. Each successful identification, each naming achieved, is an endorphin trigger and reinforces audience members to say more. Essay Review: What is your favorite Lost Landscapes film? Rick Prelinger: I like Lost Landscapes of Los Angeles (see above). Essay Review: What are you working on now? Rick Prelinger: Day to day I’m working (with partner Megan and scanner operators Adrianne Finelli and Steve Polta) on the home movie collection — preparing, scanning, logging, managing files; an endless but exciting job. The scanning project is occasioned, among other things, by a project at whose start I now find myself: a film tentatively called City. City will counterpose word and image: home movies showing the lived experience of 20th-century city dwellers counterposed with planners’ and historians’ descriptions and theories of urbanism and urban life. What these elites said powerfully influenced the development of law and policy and the lives of the people seen in the films. I hope the film will encourage audiences to challenge the authority of theory and history, to critically examine evidence contained in ephemeral images, and to find their way toward a path by which popular experience and theory can, like city residents, collide, contest and collaborate. And though I don’t want to build my life around making urban history events, I’m working on a New York film, and I hope to have news about a fall 2017 screening. Essay Review: Who do you think about when you think about predecessors or kin? In other words, whose work do you feel Lost Landscapes builds upon, echoes, or relates to? Rick Prelinger: So Lost Landscapes is definitely informed by two predecessors: city symphonies (it could be argued that all of the Lost Landscapes are 21st-century city symphonies, although they move more slowly than Ruttmann’s and Vertov’s), and the documentary movement that we associate with the 1930s and the New Deal. And I’d probably say that I’m interested in getting people to view film as we now view photographs; to look for threads of evidence and evidence of artistry, rather than feel like they’re watching a movie with all the expectations we feel when we sit down in a theater. But the idea of evidentiary (or evidence-based) cinema is fairly new, as is the “lightly produced” aesthetic. And the idea of films-as-events, of disavowing cinematic power and authority, definitely turns this practice into an outsider practice. Essay Review: What role does audience involvement play in Lost Landscapes? Are the participatory screenings half of the experience? Why does audience involvement matter? Do you consider the audience when constructing a new Lost Landscapes? Rick Prelinger: Participation is everything. While I make all the films available online (unless I lack permission from footage owners who have given me permission only to show material live), they are meant to be seen live with a active audience. And it’s possible that some viewers come to join in the event more than they come to watch. I guessed this when No More Road Trips? played at the San Francisco International Film Festival, and many people came with little idea about what they were going to see but because they knew they were going to be encouraged to talk. As I’ve often said, I used to think that asking people to talk during a movie was radical. But I now realize this is a highly traditional practice. Think of the theaters in Times Square or downtown Brooklyn, where viewers pick a side to root for. Or further back: the benshi in classical Japanese cinema. Or even further: the Elizabethan theater, with the groundlings in the pit making very sure that the actors and other audience members knew what they thought of the performance. Elizabeth Maddock Dillon writes about how, after the common lands were enclosed, the deterritorialized commons was remapped into the space of the theater (New World Drama: The Performative Commons in the Atlantic World, 1649-1849 [Duke, 2014]). Racially integrated audiences used the theater space to perform social relations. Eighteenth and early-nineteenth-century audience members didn’t just go to the theater to see a play, they went to represent themselves, to make common space and often common cause. In 1804 a Boston writer complained that the theater didn’t have bright enough lighting during the show, because people weren’t there just for the performance! And when Richard III was performed at the Bowery Theater in New York in 1832, over 300 audience members swarmed the stage to assist in slaying the tyrannical King. Darkness enables all flavors of transgression. And I would like to think that we might be doing something more than talking during a movie. Could we too be modeling the commons? There is great potential in assemblies of large groups of people, and we rarely take advantage of them. To do so would mean abandoning the idea that we are here for a show and instead realizing that the show is us and we are the show. I bring this up every year in my pre-screening remarks. Why are you here? What would you like to do? What does the future city you want to live in look like? This is a high jump for people who think they’re just going to the movies, but it’s a question we need to keep asking in increasingly urgent terms. Why are we here and what do we want?